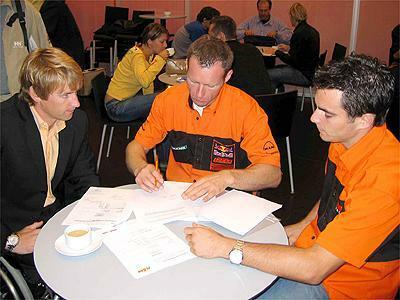 KTM has completed its line-up for the 2005 FIM World MX Championships with recent signings Carl Nunn and Julien Bill. British former GP winner Nunn, 25, finished eighth in the 2004 MX2 championship and will ride the KTM 125cc works two-stroke. He'll ride alongside Marc De Reuver and Tyla Rattray. Meanwhile 21-year-old Bill will ride in the MX3 class alongside Demaria and Breugelmans. In the MX1 class, KTM will be relying on Ben Townley, Kenneth Gundersen and Steve Ramon. "When the RTT honda team folded a few months ago I was panicking," said Nunn. "I head that KTM were interested in me earlier in the season and thankfully they came calling again. They wanted to restart the 125cc programme and didn't have another suitable rider. I was able to ride the factory bike at the Cardiff SX and it was like a rocket compared to the standard bike I had been using. Expectations will be high, but I want to be going for the top five at least."